I am terribly unhappy - Pete is missing! I am terribly unhappy. Since yesterday morning Pete did not come home. Emily was sitting on an egg which she has laid yesterday night and in the morning Pete flew away and did not return since then. I have the suspicion that he suddenly decided to leave with one of his girlfriends. I have already told you that Emily's eggs are not fertilized any more since a couple of breeding cycles. Maybe she is in that age when hens stop laying - i have no idea. 2 days ago both, Pete and Emily were still sitting happily together, grooming each other in their nest. There was no sign of a split and now this. I am really devastated because Pete and Emma are our balcony family members who have started the dynasty 3 years ago. I would never have thought that Pete would ever lave her but apparently his longing for having more babies was stronger. Sorry Petra that Pete is missing. You will need to give Emily some special attention. You will need to pretend to do some nest sitting for her. She needs time off the nest to eat, poop and stretch her wings. I hope Pete will return home soon. Louise, thank heaven Emily does this. She already knows that the egg will not hatch because she left it a couple of times already for a longer period. She came in twice to eat and she flew off a few times. This at least is a good sign. I don't think she will lay another egg because in her poop this morning was a strange kind of thing that looked like the beginning of an egg. Maybe birds are capable of aborting an egg if the situation has changed - is that possible? I only hope that she can cope with the loss. I talk to her as often as I can and try to lure her inside. It's really a tragedy. I am so sorry to hear about this, Petra. I will think positive thoughts for you, Emily and Pete that he is OK and will return soon. I'm really sorry to hear that Pete is missing. I doubt that he would have left a nesting mate. They mess around, but don't normally leave the mate. He may have been gotten by a hawk or some other predator, or it is possible that someone is shooting them. That could be the problem with Jimmi too. 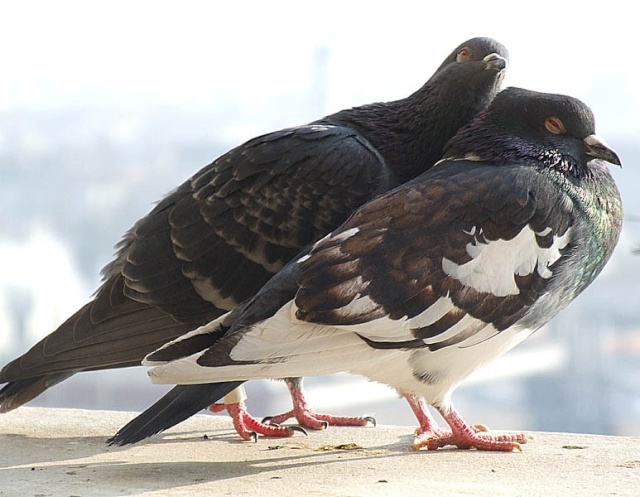 Could be some wierdo around who doesn't like pigeons. It happens. I hope he is safe and returns to you. I'm really sorry to hear that Pete is missing. I doubt that he would have left a nesting mate. They mess around, but don't normally leave the mate. He may have been gotten by a hawk or some other predator, or it is possible that someone is shooting them. That could be the problem with Jimmi too. 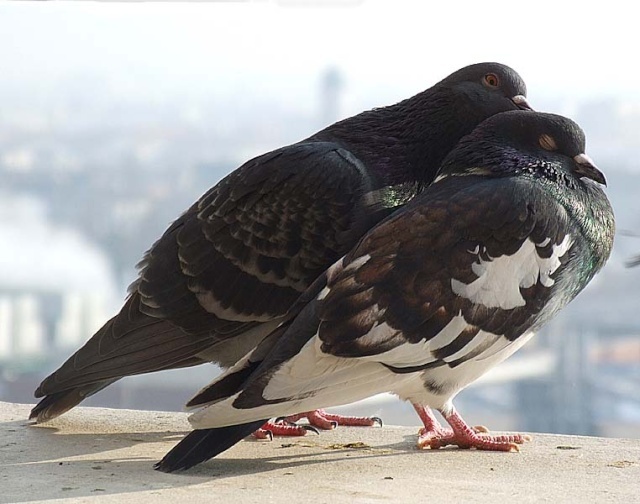 Could be some wierdo around who doesn't like pigeons. It happens. Let's hope that's not the case here. Hello, I am new here, my name is Annie. 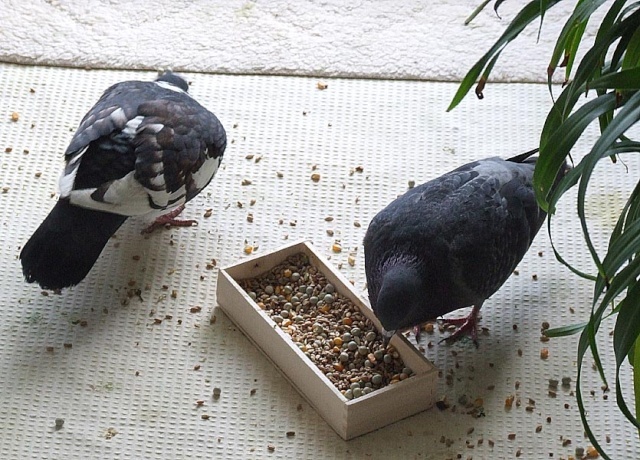 I have a friend on facebook who has a hand-reared, tame, pet, but free flying pigeon. Recently, he also disappeared, for about 5 whole days. But you know what, he returned home. Safe, tired, well. Hello, I am new here, my name is Annie. 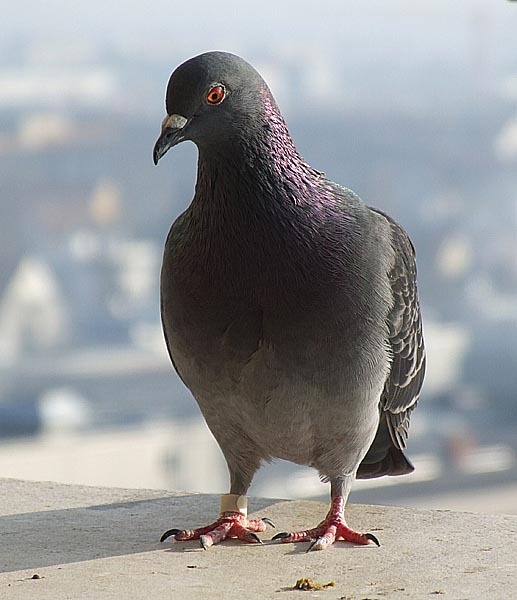 I have a friend on facebook who has a hand-reared, tame, pet, but free flying pigeon. Recently, he also disappeared, for about 5 whole days. But you know what, he returned home. Safe, tired, well. Thank you for sharing that, Annie. This is very true in many instances, Petra. Is there any update or news on your lovely Pete? I'm sorry I missed this post before, Petra. Any news on Pete? I hope he's alright! Positive thoughts continue to be sent your way, Petra. I very much apologize that I did not respond earlier but I simply could not. An era has come to an end. Thank you so much for all your comforting words. The fact is though that Pete has gone over the rainbow. I am absolutely sure of that. I am still mourning because nothing will be the same again. But there is the rest of the family - and I am grateful for this because they are a joy every day. When I wrote that Pete, our pigeon patriarch, was gone, it was not quite clear to me what had really happened. On Mar 4 I got the proof that his time was over because Emma had laid only unfertilzed eggs for about half a year now. She has a new young mate and is laying eggs again. They are fertile! The last days when Pete was here still he nearly sat for the whole day in the grand nest together with Emma. Apparently he said goodbye to her, as they were cuddling and kissing each other all the time. I did not know what was going to happen. Pete apparently told Emma that everything was okay because after he was gone Emma did not mourn as I expected but started to show interest in Rudi, Pina's mate. I was completely irritated about this because I had feared the worst to happen. But now everything is clear to me and it was my misinterpretation. Pete said goodbye to Emma and then left her to die. I am still crying when I think of the last day I saw both in the nest. I cannot help...I am still terribly sad. But I am also glad for Emma: because she has a young and virile new mate: Lucky. They both are really in love. One day, on a sunny morning in March 2008, a pigeon appeared on the balustrade of our balcony on the higher levels of the appartment building. There was something about this pigeon that made me wonder who he was. 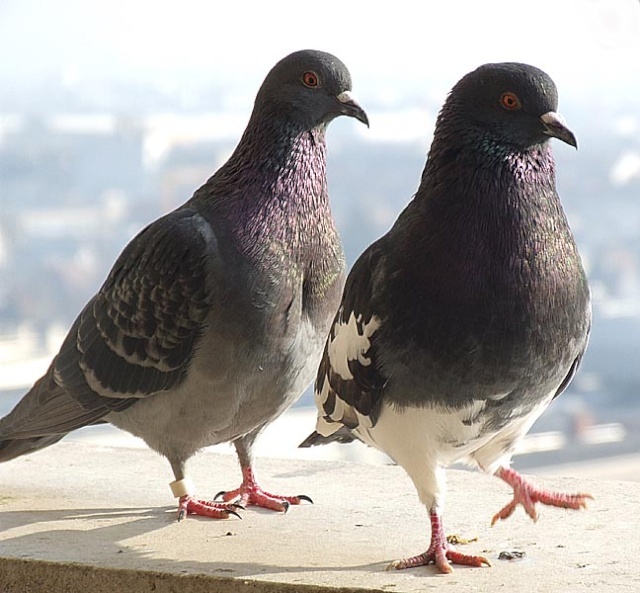 Normally I would have chased him off - as I usually did - because of my ignorance, because I did not like them pooping everywhere, because they made so much noise in the early morning that you could not sleep any more and overall I did not like pigeons very much... But this one - it was different. He - the new pigeon - let me observe him while I was inside but as soon as I opened the balcony door he was gone. So he was really a shy one. I was eager to know what would happen next.To be honest - nothing really happened for a while besides that he appeared one day and then was gone again for several days. But one day he appeared again and with him came a tiny little pigeon lady, a dark grey one, with no special markings besides a sweet face and with somehow slanted eyes which were reminiscent of Asian eyes. You realize that I started to observe these birds closer, noticing more details about them and somehow they suddenly became more and more interesting for me. I really cannot say any more when this change of mind happened to me but there was clearly a change. Pete, as I called him in the meanwhile, and Emma, his mate, still appeared only sporadically. Obviously they were a couple and both very shy. At the very moment I opened the balcony door they were gone. One day I observed them how they kissed each other and started the courtship mode. It was so interesting to watch this and I found it very sweet. So touching. I knew I could not chase them away any more if this should become an option. In the meanwhile I put my plants out on the balcony again while the weather had become warmer. 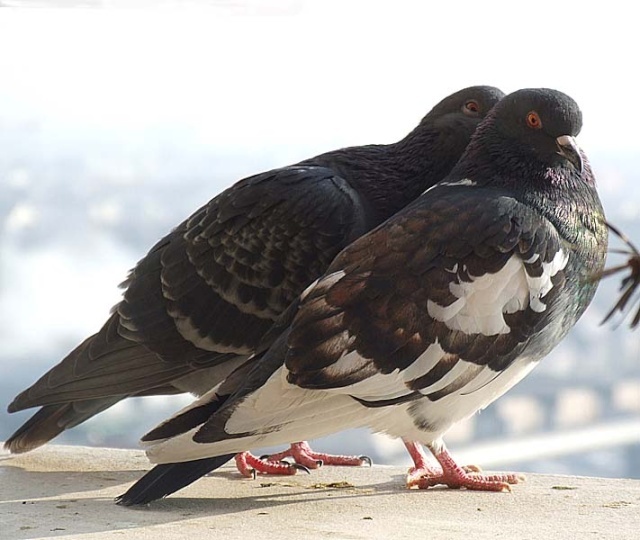 Also our pigeon couple seemed to get more accustomed to our presence and did not take off immediately any more when I openend the door. But they still flew away as soon as I came nearer than about 3 meters. And then one day, when I was watering my plants, I realized that Emma had silently built a "nest" behind a large planting pot with chlorophytum, that I had placed on another very large planting pot, that was filled with earth, just beneath the long leaves that were hanging from the pot. And she had laid 2 eggs. So what to do now? Things took on and then one day - on the 9th of April in 2008 - the first egg hatched and out came something tiny, with golden-yellow "hair", a big head, huge feet, some strange huge eyes which still could not see, a wonderful living creature that changed our lives completely. This was Willy, our "first born". And then, two days later, little Joey climbed out of his egg shell. 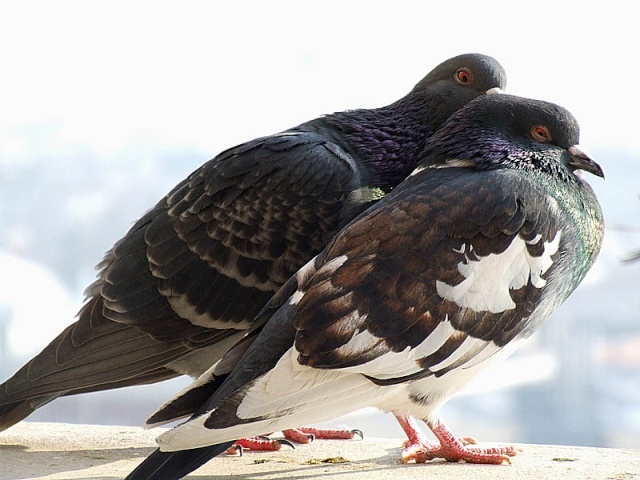 I firmly believe that pigeons communicate in a way we humans do not realize. The last few days while Pete was still here he was taking care of Emma. I firmly believe that it was NOT an accident that Lucky became the new mate of Emma because he was still so young - much less than a year - I think it was somehow Pete's doing - they knew each other - and Pete was aware that Lucky was a very strong bird. I cannot prove this all - it is just my instinct that is telling me that there was something going on. Fact is that Emma is totally exchanged, happy, eating with great appetite and not sad at all. And Lucky - he has taken over Pete's reign on the balcony - he is the young new king now! Thank you for your post, Petra, it was wonderful to read a brief reminder of Pete's appearance on your balcony, his life, and how he changed yours. Wherever you are, dearest Pete, may the sun always shine on your wings and the sky always be blue above you. I am really sorry about Pete, Peta. When we get a gut feeling about something and it's usually right. But please don't give up hope. Teresa and Cindy - thank you so much for your comforting words. Yes - it is a very bittersweet story. But life is going on without Pete, who - I am sure of - will have his reign beyond the rainbow and look down on all of us as the wise and friendly and strong pigeon he always was. Thank you for sharing with us the beautiful photos of Emma and Lucky, Petra. 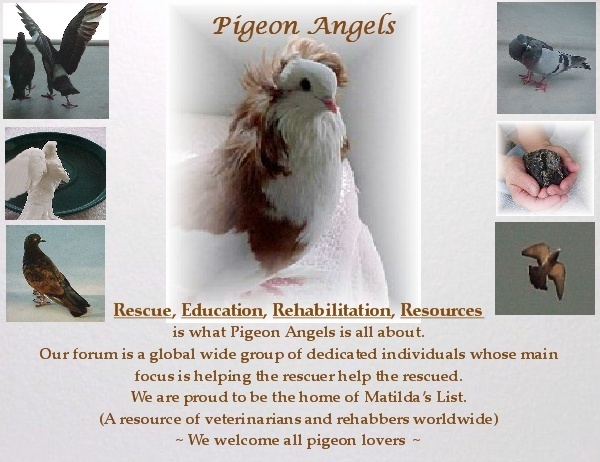 The photos are beautiful Petra Its so good to read that lovely Emma has found a new mate & happiness. Thank you for posting them, Petra. I wish Emma and Lucky all the happiness in the world! Thank you all so much. Emma and Lucky are really a lovely couple. And Lucky - although he is still so young - only about 9 months old - takes his new duties very seriously!!!! His markings are lovely, so striking! I hope so!! No pressure, Petra. Subject: Re: I am terribly unhappy - Pete is missing!